First up, I honestly thought I had written to say that Mr RTS got the job he was going for last time I posted. I must have written the post in my head, but not in reality! Anyway – he got the job. It’s longer hours and less pay than his last job, but much more interesting work, so we’re going to see how it goes. In sewing news, I’ve made a start on my comfy clothes. None of these are very exciting, but they are all comfy. First is the frumpiest thing I think I’ve ever sewn, but it is really comfy and very warm. It’s slightly on the large side, but I didn’t pre-wash the fabric (I never do with jersey) so I’m waiting until it’s been washed a couple of times before I alter it just in case in shrinks a little. I used, yet again, Simplicity 3696, as I do for nearly all my nightwear. I had bought two lengths of this fabric because I also wanted to make a PJ top to go with my beige and cream stripe PJ pants. I also managed to squidge another simple t-shirt from the remnants. 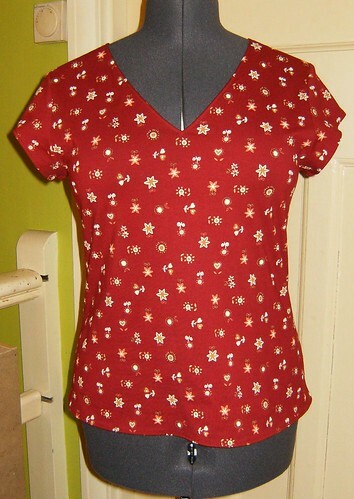 I keep making this t-shirt from remnants, but forget every single time that the pattern is slightly too small for me. 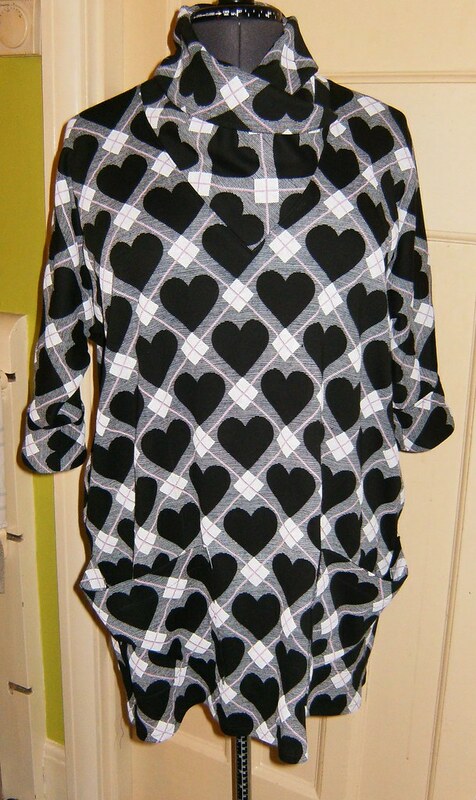 I must find a new simple t-shirt pattern, or alter this one. I also made my crazy prints lounge outfit using Simplicity 2289 (top) and 3696 (pants). The sizing on the top was strange. 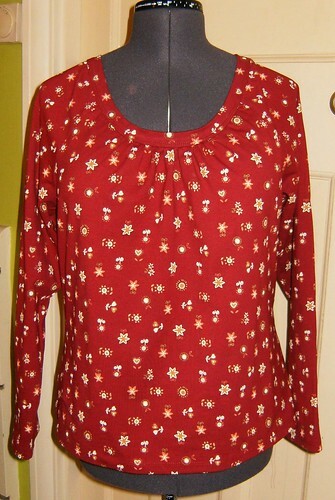 I originally sewed a size M, and this was huge in the body, but surprisingly snug at the cuffs. There wasn’t much I could do about the cuffs, but I did take about 3cm off each side seam to make it not quite as sack-like as it came out originally – this brought it closer to being a size S. I also doubled the fabric for the collar piece because the wrong side of the fabric shows when worn and the jersey I used was plain black on the back. Next is another faux dress (same as the black and white polka dot version I made ages ago). I managed to squeeze this out of 1.5m of fabric and I was really impressed that I was able to nearly match the vertical pattern through the skirt and top even though I had so little fabric. The fabric for this is very strange (and I have some more cuts of it in different prints). My local fabric store calls it “warm jersey” and it has a strange, almost velvet or moleskin-like, texture. It clings to itself horribly when trying to pin and sew, but not so much when wearing. 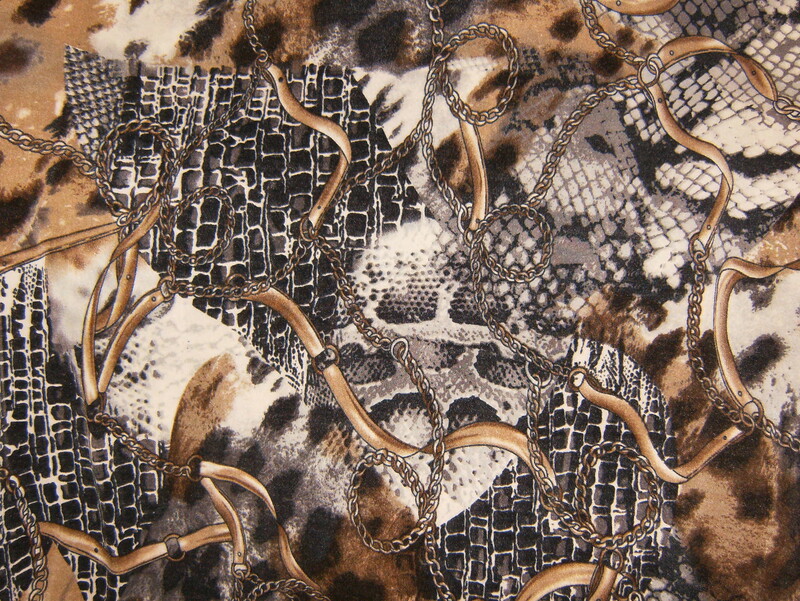 I’m not really looking forward to sewing with it again, but it comes in such amazing prints that I can’t resist. I’ve also sewn my first version of the Tiramisu dress, that didn’t work out too well (my fault, not the pattern’s), but I think I’ll give that a separate post. Because Mr RTS got the job I’m not on quite such a fabric fast as I thought I would be and when I was in town a few weeks ago a few more managed to sneak their way into my stash. Quite a few of them are for, surprise, surprise, PJs using S3696! I don’t tend to sleep in the PJs – I prefer to wear a nightie for sleep, then get up in the morning and change into PJs to doss around in :). 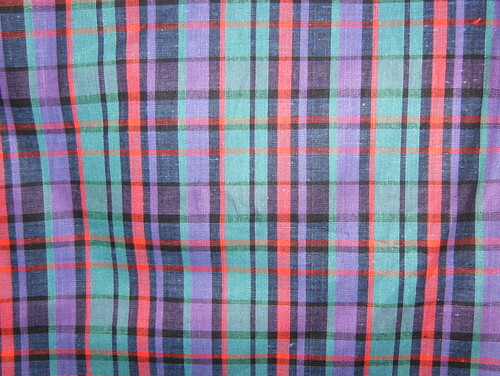 This first one is a fabulously warm, double-faced (one side check the other plain purple), cotton. I think I may have squeed when I saw this. 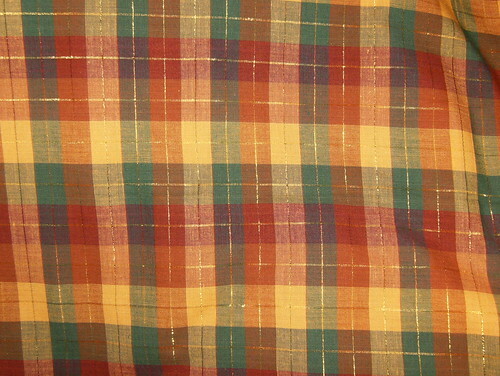 The check side of it looks and feels almost like linen, but the plain side feels like brushed cotton. I love the look of linen, but can’t wear it because it prickles my skin unbearably, so I’m always happy to find a linen look fabric. I’ve already cut PJ pants out of this. I bought 2.5m because I wanted to be sure about matching the check and I also managed to squeeze a Vogue 1247 skirt out of the remnants. I also bought some purple lycra jersey to make a matching top. My camera is rubbish, but in real life the purples in the jersey and the check fabric are a perfect match. Purple is probably my all time favourite colour, but doesn’t really suit me that well in clothing – but for PJs anything goes. Again, this is already cut out using the same pattern as the red, long-sleeved top above. More checks for more PJs. 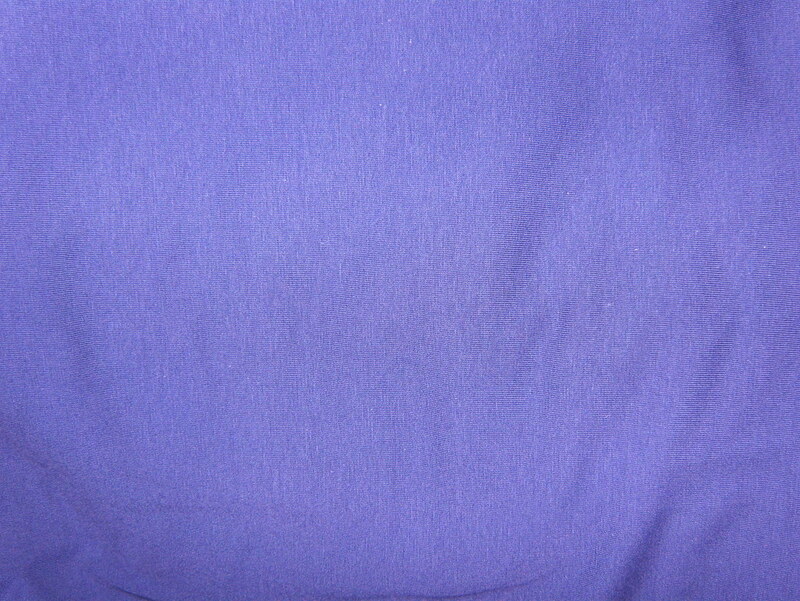 This one is a really soft, lightweight cotton that feels as though it has already been washed a million times. (The check is square – I photographed it on a non-flat surface). The darkest lines in it are a navy blue and I have had a cut of navy lycra jersey in my stash for ages. It was one of those fabrics I bought because it was such good quality and then realised that I never wear navy. I worked in legal offices for years and years and navy is, to me, too much of an office colour so I never wear it now. It will now become a short-sleeved t-shirt to wear with these pants. Last PJ fabric. 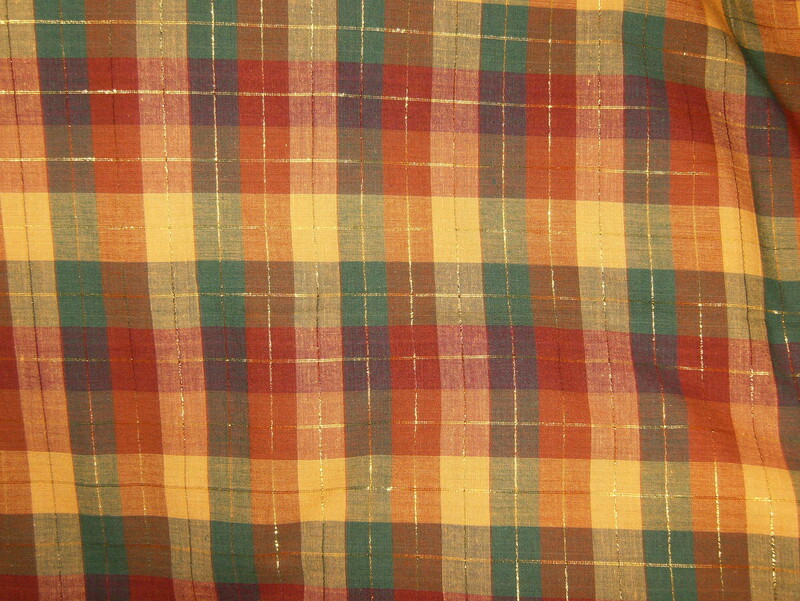 This is another really lightweight cotton. 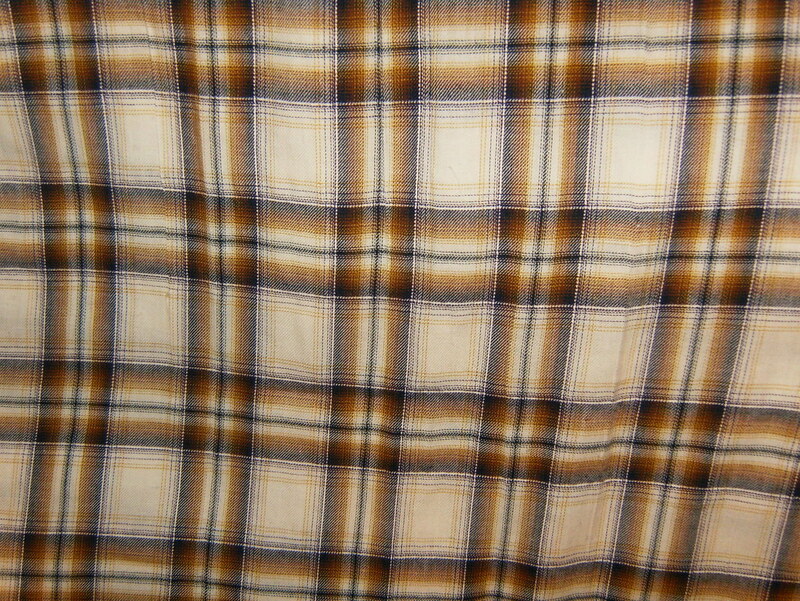 To go with this I have a cut of chocolate brown jersey that I originally bought to make a top to go with my beige and cream stripe PJ pants. 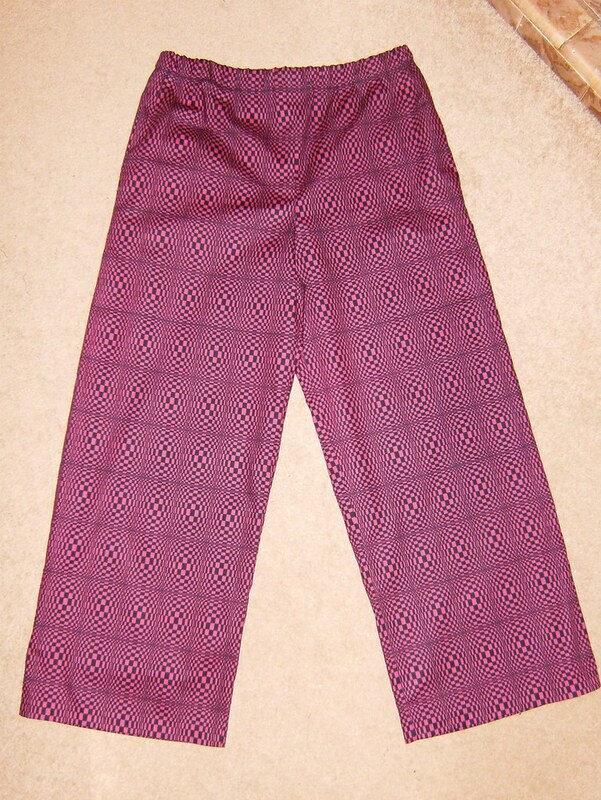 Again, these pants and the top are cut out waiting to be sewn. I didn’t only buy PJ fabrics. I got another cut of the strange “warm jersey” to make another faux dress. See, even though it is a bit of a pain to sew, the prints are just irresistible! I got another jersey for, possibly, another Tiramisu. I like simple black and white jersey because it is so easy to wear, especially as a dress. 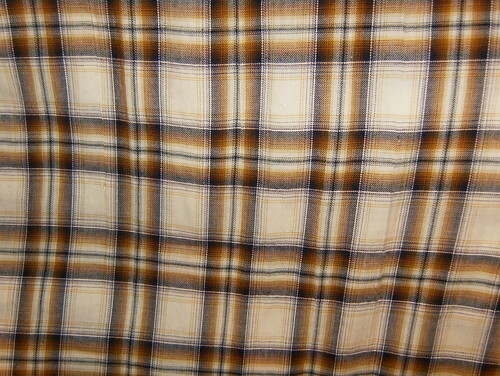 The next one is a strange, textured, stretch fabric. I’m not sure if the fabric itself is stretchy, or if it’s just the ruching that makes it so. This will probably be a very simple loose summer top. The last one I bought with absolutely no idea what I’m going to make. It’s a cotton and slightly on the stiff side. 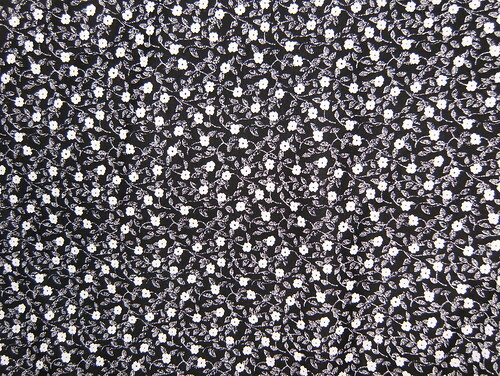 I don’t buy many cottons any more, mainly because they tend to not drape well, but occasionally I can’t resist a print. This one seems to want to be a shift dress, but shift dresses don’t really suit me so it’s going to have to gently age in my stash until the right project shows itself. 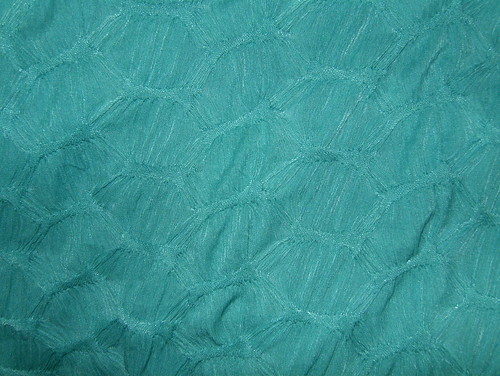 I only bought 3m (of 115cm wide) so I am somewhat limited as to what I can make with it. That was deliberate though, because I have far too many unused 4m and 5m lengths already. Worst case scenario – more PJs!! One thing that really made me laugh was that when I got home with these new fabrics and added them to my fabric notebook it brought my total stash column to 399.90m. When I was buying them I’d commented to Mr RTS that this haul was bound to break the 400m mark and I was wrong – just :). 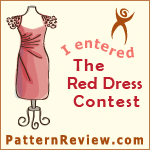 This entry was posted in Finished Projects, Sewing, Sewing Plans and tagged cotton, dress, fabric, jersey, PJs, Simplicity, stash, tops. Bookmark the permalink. Love the faux dress! This one and the polka dot version. 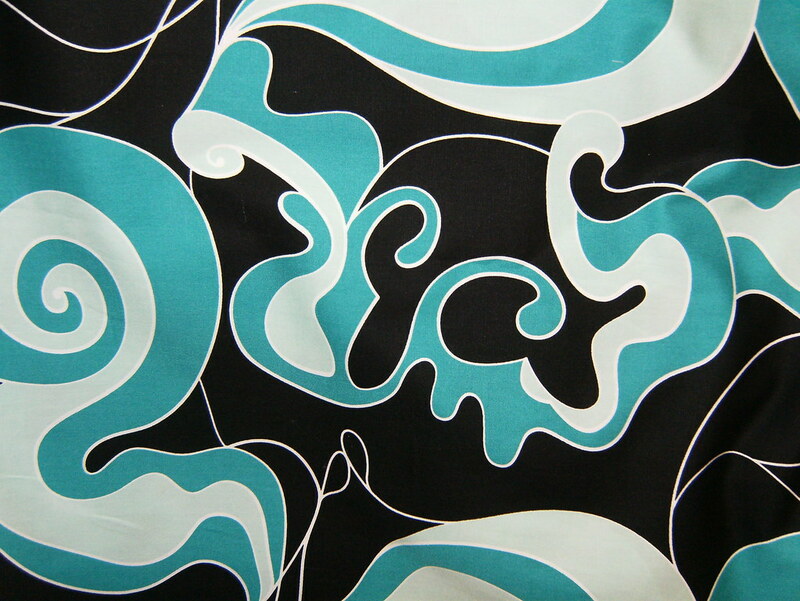 And that aqua paisley cotton could make a cool straight skirt?? Looks like you have been super productive in the sewing department. I also think the dress is fabulous! And the PJs might not be exciting but they sure are practical. 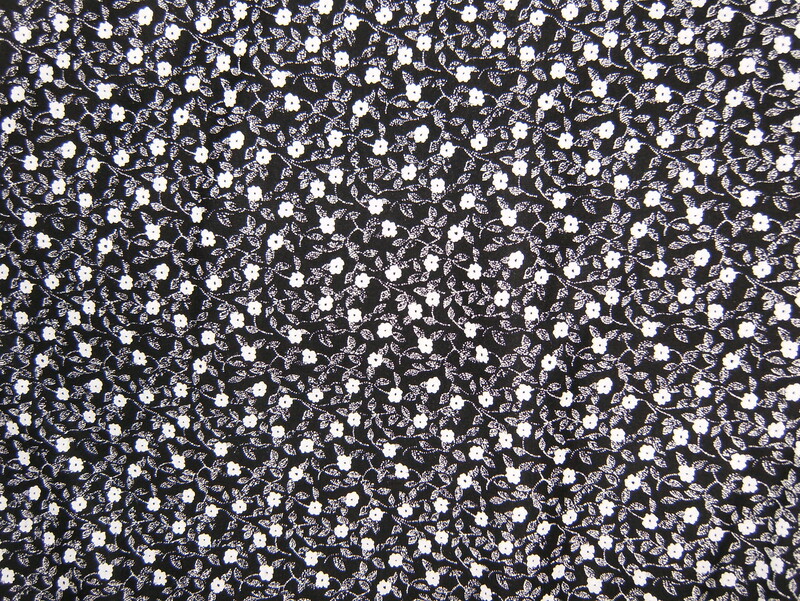 Your new fabric is really pretty too. Can’t wait to see what you make – even if it is more PJs! Wow you have been busy. Great outfits (plural!). Congrats to your husband, you both must be relieved. You have been impressively busy. Lots to love here under the heading “comfortable”! Some super cute comfy clothes here- loving it!!!!! So proud that the hubby ,got his job and is liking it. 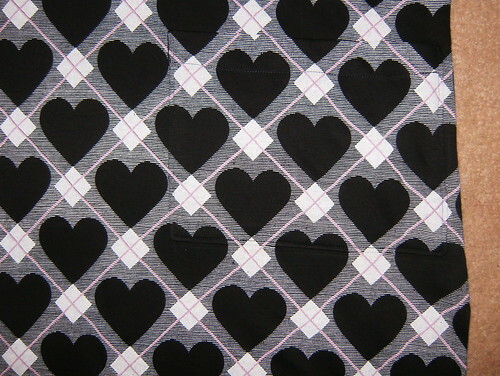 Love your new fabric.. so fun to buy fabric!!!!!!!! !